Take the Oath. No, please — take it. Video is huge and it's all over the place; what ails the ad industry; the ethics around corporate social responsibility; Twitter Lite addresses a concern; stories are everywhere; why Google is so lit; disruption follows a predictable pattern; what dogs and manufacturing have in common; Uber continues its ethical death spiral; why Detroit leads Silicon Valley in one area; the ideal length of a podcast is...; the web's UX needs help; marketing reporting 101; forced friendliness may be our downfall; and more in the oath-laden ethical edition of The Full Monty. We're sure you subscribe to The Full Monty podcast, and don't forget check out where Brain+Trust is speaking (final section below). Programming note: we'll be off next week. YouTube TV is starting in five markets, with live television programming available through the YouTube app for $35 a month. It includes 6 accounts per household and unlimited DVR storage. Facebook's head of video says one in five videos shared are Live videos, with Live broadcasting daily watch time growing 4x in the past year. comScore says that in December 2016, for every hour dual-use households (traditional and OTT) spent watching OTT, they spent almost 5-and-a-half hours with live TV. AT&T will be offering HBO for free in its Unlimited Plus plan; customers that already get HBO through AT&T's DirecTV or U-Verse will also have access. Let's not forget that AT&T is in the process of trying to acquire Time Warner, the parent company of HBO. How magnanimous of them. And as mobile telco AT&T gets into cable, cable-TV giant Comcast is unveiling cellular plans to challenge Verizon and AT&T. Keep your eye on the ball, folks! Things are moving faster than a shell game. Amazon will be carrying 10 NFL games on Thursday nights this season. Last year, Twitter was the big winner, and they, along with Facebook and YouTube, were bidding for the rights this year. Amazon took the package for $50 million. See more in the Platforms section below. Teens love them some mobile video. 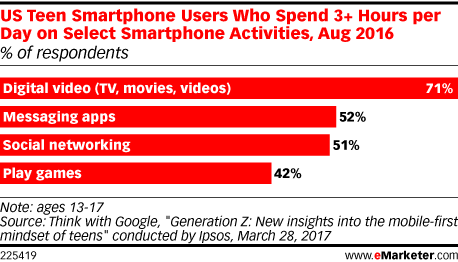 Over 70% of teens spend at least three hours a day watching mobile video. As the father of a 13 year-old, I can attest. Fake news publishers are still earning money from major ad networks, despite the crackdown on fake news. In this long but essential read, one publisher notes that the only thing that matters is eyeballs, not the quality or veracity of the content. Bottom line: if you are responsible for media buying in your organization, you or your team might want to make note of some of these ad networks and decide how you'll handle the ethics of doing business with them. Google is including fact checks with all of its searches globally. Google hopes special callouts for fact-checking articles will help searchers get the right answers or better make their own decisions. That is, if ultra-partisan netizens from the left and right can get it through their skulls that Snopes and FactCheck.org are fact-based organizations (i.e., neutral). From Digiday's "Confessions" series, an advertising veteran notes that lack of intellectual curiosity and rigor around shiny object syndrome is ruining the ad industry. Thanks for that, chief. Amazon has set the bar for everyone, and it's getting higher. Currently, 40% of retailers indicate personalization is a top priority for digital. It comes down to more than "people who bought that also bought this" — they want recommendations based on their own purchase history and current interests. Just in case you haven't seen it, here's that Kendall Jenner Pepsi ad that got everyone riled up, including Stephen Colbert and this guy. Last week's Full Monty podcast episode touched on the matter (ever so briefly). More on that below. If you're seeing this, please inquire about getting your company or product here. Snapchat set the tone, but now everyone is coming at you with Stories. Stories are the new newsfeed. Twitter launched a faster version of its mobile service called Twitter Lite, for those who don't have high-speed access or who have data issues. This may help with user growth outside of the U.S. market. And no, there's no truth to the rumor that the original Twitter is referred to as 'Facebook Lite'. Embracing its roots, Twitter released its new API platform, roadmap and vision for the developer community. In Twitter's early days, the third-party apps and tools that grew alongside Twitter made it much more powerful and multifunctional than it is today. Let's see if this can't help get Twitter back to where it once was. Publishers such as USA Today Sports Media Group are reaping financial returns from touting their videos using Twitter's Amplify program. And Twitter is ensuring that video publishers know there's a big upside. Twitter is seeking to make deals with pay-TV companies that would let subscribers watch live channels over the social network as part of a major video push. Mastodon.social is here and is seen as a challenger to Twitter. We remain skeptical, but we'll see how it plays out. Stories may be the new newsfeed, but it seems that the uptake of Facebook stories is so slow that some of your friends might look like ghosts. Facebook Messenger opens its M assistant to all U.S. users, easing the process of sending money in chats, sharing locations, making plans, starting a poll and the like. WhatsApp will be launching peer-to-peer payments in India in the next six months. Snapchat is changing how users find stories, making the search feature function across stories as well as across accounts. Finally — a feature of Facebook that Snapchat copies. How do users like Snapchat ads? Fifty-one percent of Americans who use Snapchat don't engage with branded filters or lenses, JPMorgan Chase reports, and 73% don't swipe on ads. Additionally, 68% never watch video ads. Roughly 28% of teen and millennial users said they “hated” the ads seen on Snapchat, while 20% said the same about Instagram ads. When it comes to influencers, Snapchat and Instagram are not the same; Instagram seems to be the preferred platform. Google commissioned a survey to study what teens think is cool, and surprise! They like Google. According to Google. The study: It's Lit: a Guide to What Teens Think is Cool. Males are much more into video games than females; they're also more likely to be influenced by fads and friends while females are influenced by how something makes them feel. Of the brands they're most aware of, the most cool are: YouTube, Netflix and Google; and least cool are: Yahoo, Sprint and McDonalds. YouTube is requiring channels to have at least 10,000 views before they're allowed to run ads. This is in an effort to crack down on unlicensed re-uploads of popular videos, a process commonly referred to as "freebooting." The merger of AOL and Yahoo within Verizon is coming about, and the new entity will be called Oath. Yes, you read that correctly. They claim to be launching "one of the most disruptive brand companies in digital." If they mean by the use of their logo, then we'd like to remind them of The Gap. LinkedIn is enabling mobile-optimized lead-generation forms to be inserted into sponsored posts. Despite its past missteps in social, Microsoft is launching Who's In, an iMessage app, aimed at helping friends plan events and outings. Regardless of the industry, disruption follows the same five stages: the Kodak moment, Internet infrastructure, disruptive business models, IoT and artificial intelligence, and the adoption curve. On demand manufacturing is a way to utilize machine downtime and reduce expensive equipment purchasing and leasing. Uber for manufacturing. Dog sharing is another hot new thing in the collaborative economy. Uberman pinscher? Airbnb's New York City problem is just getting worse. “When you’re effectively illegal in the media capital of the world, that’s a problem,” according to a regulatory strategist. Sources say that Lyft is raising $500 million at a $6.9 billion valuation, giving it a a 50% increase over its January 2016 valuation. All the better to compete with Uber. Uber has devised a "clever and sophisticated" scheme to defraud passengers and drivers. With it, Uber is able to manipulate navigation data used to determine "upfront" rider fare prices while secretly short-changing the driver, according to a proposed class-action lawsuit against the ride-hailing app. Just one more reason to hate delete Uber. Seriously, you love the UX and the convenience, but when will you allow your ethics to claim victory? Despite the growing litany of issues, Uber won't fire its CEO. The reason: he has supervotes, and with them, control of the board. All of the things ailing Uber are not unique to Uber nor to the tech industry. And they're not PR problems; they're business and leadership problems. Ford admits that the future will include a diminishing rate of car ownership. And it is preparing accordingly. This may come as a shock to some in the tech set, but Detroit is actually leading Silicon Valley in autonomous vehicles. 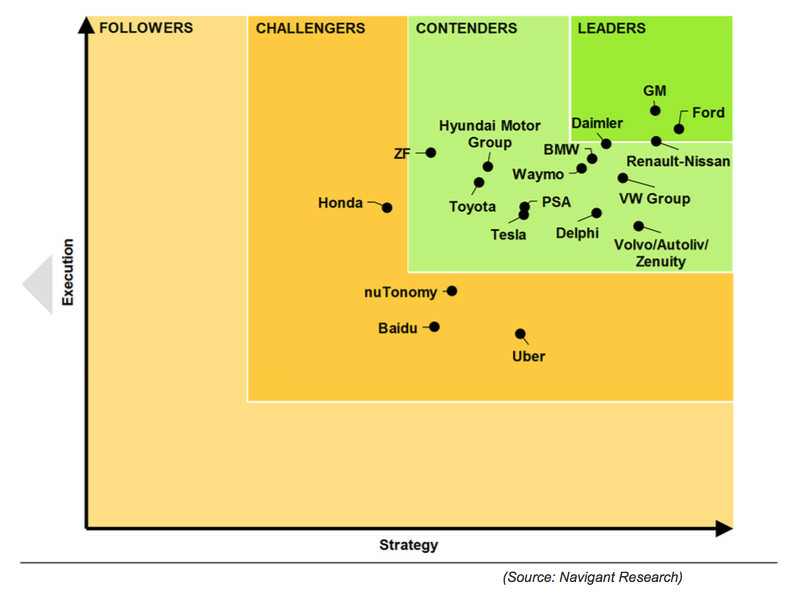 According to Navigant Research, Ford, GM, Daimler and Renault-Nissan are the leaders when it comes to execution and strategy. Turns out that building cars gives you a bit of an advantage. The chat wars are coming! When it comes to matching up against Google, Facebook and Microsoft, Slack is prepared. With the term constantly being thrown about, here are 11 facts about chatbots that you might not know. One is: don't blur the lines between humans and bots; people want to know when they're dealing with another human being. For celebrities who already use Twitter, Instagram and Snapchat to lend a personal touch to their interactions with fans, the next frontier of social media is a deliberately impersonal one: chatbots. Video game industry icon Peter Molyneux is worried that VR is being oversold to consumers before the industry is ready. And why they'll need a couple of titles to help define it. It needs to be about context. A new VR exhibit at the Carnegie Museum of Art in Pittsburgh transports viewers to fictional landscapes with four separate 3-minute experiences. The exhibit presents a “digital dystopia inflected by rapid climate change, social unrest, and shifting global economics.” A powerful way to share a message of urgency. How long should a podcast be? It's the age-old question with a variety of answers. We'll go with Abraham Lincoln's answer to the question, "How long should a man's legs be in proportion to his body?" Lincoln replied: "I have not given the matter much consideration, but on first blush I should judge they ought to be long enough to reach from his body to the ground." Another hit from the Serial team: S-Town has over 10 million downloads so far. After two years of sometimes tense negotiations, Universal Music Group has reached a long-term deal to have its songs streamed on Spotify. The deal is crucial for Spotify, with 50 million paid subscribers worldwide, as it puts the company, currently valued at $8.5 billion, on a firmer track to go public in 2018. Have you ever considered giving your conference room presentation a soundtrack? You might consider creating a music playlist for your next meeting. The Podcast Consumer 2017 conference call from Edison Research will be held on April 17. You'll want to sign up. Program of the Week: NPR's new weekday morning feature Up First. It's a 10-minute on-ramp to the day's news. Do you have a program to recommend? Add yours to our Google Sheet: smonty.co/yourpodcasts. Do you know the difference between content and content marketing? To paraphrase Mark Twain, "'tis the difference between lightning and a lightning bug." Mitch Joel describes the reason he subscribed to the New York Times (it's not the reason you think). 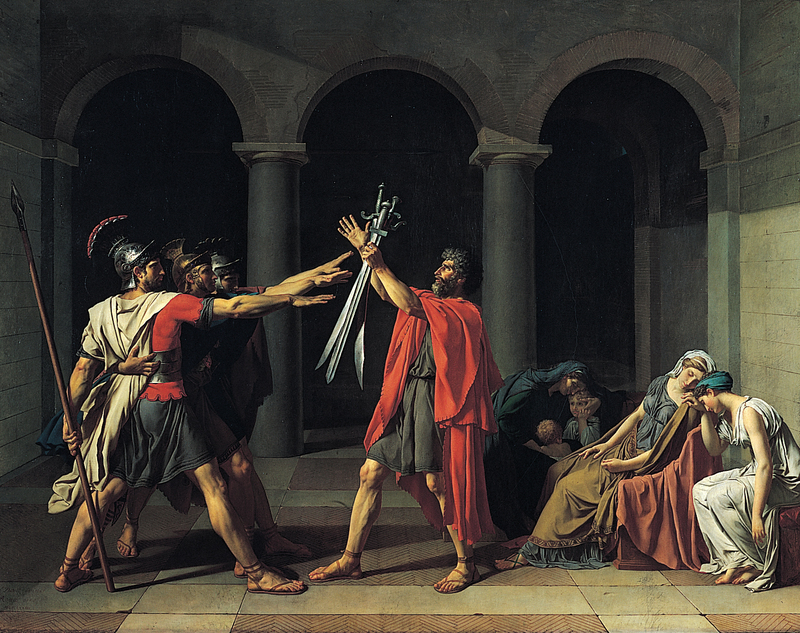 Your content strategy should make people behave like this. The web doesn't look so hot. According to this post, the web looks like sh*t. Please take heed of these mistakes. If you're looking for a way to get your content noticed or find better distribution channels, you could always write for another site. Here are 150+ sites to guest post on. Google's Android team describes malware that turned Android phones into powerful espionage tools. Oh, just a reminder about 45's phone of choice. Twitter sued the U.S. government, which was trying to uncover the identity of the owner of the anti-Trump Twitter account @ALT_uscis. The day after the suit was filed, the government dropped its case. The Shadow Brokers, the mysterious group linked to exploits stolen from the National Security Agency, released a large catalog of files Saturday that give further insight into the elite spy agency's hacking methods. Forced friendliness is costing us our authenticity. Have you seen the "Nosedive" episode of Black Mirror? This dad had fun Photoshopping his baby into dangerous situations. Some people on the Internet didn't get his sense of humor. Add some literary sophistication to your visual communications with Postepic, the app that helps you elegantly share book quotes. You do remember what a book is, don't you?? Hey, Carter needs his nuggs. How about a retweet? Only 18 million and Wendy's grants his wish.